This mighty Swedish black metal machine is back with their sixth studio and their first album since 2009's Angelus Exuro pro Eternus. This is also their first album with their new vocalist Heljarmadr (formerly of Gra, Domgård, and Cursed 13). The result? Well, it is one of the absolute finest black metal albums of the year, thus far, and one of the very best of their long career. The album opens with the blisteringly fast "Unchain My Soul", which is one of the very best tracks on it. A wonderfully dark opening leads to rhythmic and continuous assault on the senses in the lightning fast "Beast Above Man". My favorite track on the album has to be the purely evil and chilling "To Carve Another Wound". It's dark and driving as well worthy of you throwing up the metal horns. By the time the time the savagely fast title track closes off this masterpiece you will remember everything that made you fall in love with black metal and more. Vocalist Heljarmadr is an incredible addition to the band. I love that his voice sounds raspy as hell (pun not intended), but you can clearly understand what he says. Which is great cause the lyrics are filled with images of evil and Satanic acts of horror and violence. The guitars by Chaq Mol and Lord Ahirman (who writes the lyrics and also plays the bass) sound great and add a chilling feel to the whole experience. Meanwhile, Dominator does just on the drums. He is a monster on his drum-set! Filled with insane blast beats and a full on attack this some of the best drumming in extreme metal this year. The production on this is excellent and really fits the music. It adds to the cold, distant, and Satanic sound of it perfectly. 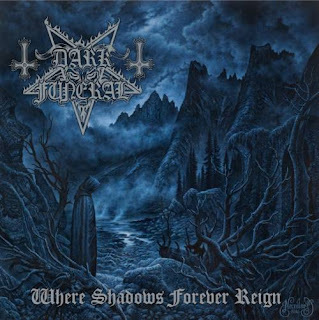 Where Shadows Forever Reign is an album I simply cannot stop listening to. It's songs get stuck in my head, and feel the need to hear it again and again. And, the more I hear it, the more I like it! Everything about it is dark, violent, unquestionably evil, and filled to the brim with anger and seething with hate. Yet, like a really awesome horror movie, there is something really fun in here that makes it appealing to one's ears. The horned one must surely and rightfully be pleased with this killer album that is destined to make my top 10 of the year.